Many people are already well aware of the pain that can come to the armpit from being stuck using crutches for weeks and months at a time. And those individuals not yet acquainted with the agony of crutches, soon find out that it's terribly painful. Crutches can make your armpits sore for days at a time and also cause them to be raw. But, did you know that there is a way that you can help to alleviate the torturing armpit pain associated with the use of crutches? Yes. There is a viable solution that comes in the form of pads that are placed on the top of the crutch where it meets your underarms. These pads come in different shapes and sizes and significantly help to cushion your underarms from the stabbing effect and impact of supporting the majority of your weight. Why get pads for your crutches? As aforementioned being on crutches for long periods of time can produce some nasty pain for an individual. This pain can limit the ability for someone to use their crutches as they are directed and can render a person completely immobile. The best way to prevent this from occurring is to employ the use of the plush cushion pads that are essentially designed to ease armpit pain. These pads work very well to help to soften the impact of weight burdened on your pits. Overall, using these types of pads provide the tremendous benefit of decreasing pain, soreness, and aches caused by crutches. Believe it or not there is a wide variety of crutch pads that range in design, type of padding, size, amount of cushion and more. Depending upon your specific needs, you will want to select a set that you think will supply you the most benefit. Consider opting for washable pads for your crutches as sweat from your armpits can permeate onto the pads and cause stains and odor. Purchasing machine washable pads that may be removed when soiled will ultimately be a life saver to you for keeping the hygiene of you and your pair of crutches intact. 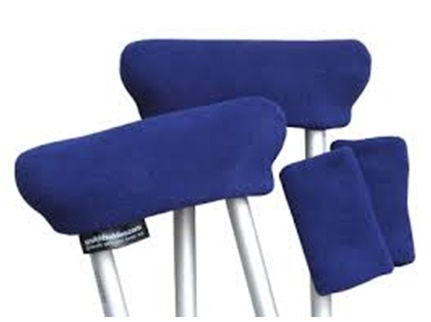 Pads for crutches are sold at many pharmacies, medical supply stores, and also can be purchased through a large array of online marketplaces. There are even some instances where you are given a pair of crutches which already possess built-in pads for your best comfort. You can always ask the physician or medical expert that prescribed the crutches to you to see if they can supply you with crutches that include pads, ask them if they have spare pads, or request that they recommend a good brand of pads for crutches to you.